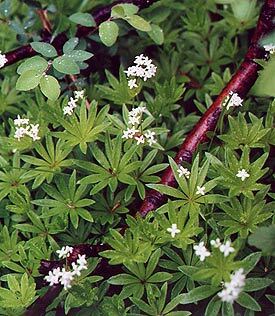 One would think that an attractive, heartily blooming, fairly quick-spreading groundcover that thrives in shade would be one of the best-known perennials on the planet, but that’s not the case with Galium. Perhaps it’s because plants need soil that isn’t allowed to dry out. So mix in ample peat moss or compost, and water it once a week, big deal. 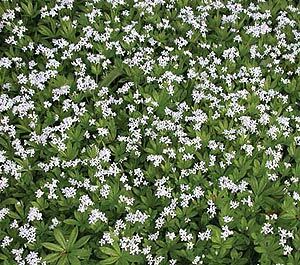 Clusters of tiny, star-like, very fragrant flowers appear in early summer atop very attractive whorls of light green, narrow lobed leaves that remain attractive all season. The foliage is also fragrant, and can be used as a culinary herb. In addition to the aforementioned soil additives and watering regimen…that’s about it. It is a true shade plant, it will grow where it’s pretty dark, but will falter in midday sun or anything more than several hours of early or end of the day stuff. Dappled shade is perfect. Even in shade, if you get a real hot stretch in summer, water it a bit more frequently, especially the first season. You can even grow it in fairly lousy soil if you don’t let the soil dry out. Sweet Woodruff is not very particular about soil pH. Use it as a groundcover in shady parts of the property where you’ll see it—alongside a path, beneath trees, fringing a deck. Good on shady slopes, mixed in with Ajuga, Lamium and Pachysandra. It’s great as the matte around and between hosta and other shade perennials. Wine makers, you can experiment with it as a flavor additive. The important thing is, buy lots of it. Buy it in flats. You want to start with at least 12 plants, 32 would be better. Plant in a grid eight to 12 inches apart. Hardy to Zone 4.